Once you achieve a certain social status in Belgrade, you must view the parking reserved for the handicapped as metaphorical. Despite what appears to be a space which is reserved for a person with some kind of physical disability, in reality it is merely a metaphor for the various societal woes which beset the citizenry and therefore is open to wide and (sometimes) poetic interpretation. Further, the difficulty of explaining all that is also cruel and unusual treatment and citizens who do so qualify as disabled. I admit that I have often looked around the city and wondered if there are as many people with disabilities as there are parking spaces for them. This is only because of the evidence of the empty spaces. But this is because I did not understand the importance of metaphor and allegory. The roadways of Belgrade and other towns and cities around Serbia do indeed have a fair number of parking places OSTENSIBLY reserved for persons with disabilities. In fact they are reserved for cases or hardship, inconvenience, and the making of statements. Many people make statements in different ways. Some, for example, will put on their emergency lights and leave their car anywhere they want. These people make a statement that says “I do not acknowledge the rights of anyone around me.” Or they could just be in a hurry. That fully justifies cutting off a full lane of traffic while you run into a shop to chat with your brother’s neighbor. And maybe grab a quick coffee. Or lunch. The local constabulary, if they believe it necessary to accost these people, will hear their excuse (I was only going to be a minute) and will generally let them off with a warning. The warning is: don’t make me fill out any papers about this. 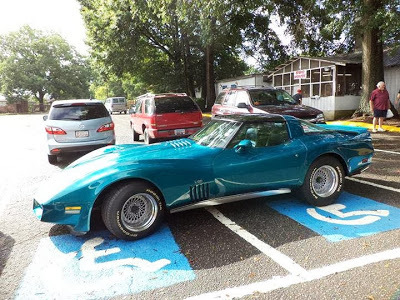 The lesson we learn is that handicapped parking is for anyone with a fancy enough car or a creative enough description of their misery, FORCING them to park there. On behalf of the City of Belgrade, it is our hope that you have found this User’s Guide useful and that you too will engage (unpunished) in unlawful parking practices at your earliest convenience. This entry was posted in Essays and tagged Belgrade, Chris Farmer, disability, disabled, handicap, irony, Mercator, metaphor, parking, Serbia, The Standard Deviation. Bookmark the permalink.